Fast-food workers were on the streets asking for wage hikes and union rights, but the candidates spoke to the billionaire class. The first Republican president of the United States was a friend of labor and a champion of working people. Despite the ideological apostasy of the 16th president’s political descendants, however, the Lincoln sensibility was on display in Milwaukee Tuesday night. Would you raise the minimum wage? "I would not do it," responded billionaire Donald Trump. Behind the security barricades and police lines that separated the debaters from the residents of a city that in 2012 cast just 19 percent of its votes for the Republican ticket of Mitt Romney and Wisconsinite Paul Ryan, the Republican hopefuls spoke as elitists rather than populists. They could not, however, completely ignore the demands of the working Milwaukeeans—and residents of other cities where thousands of fast-food workers struck Tuesday for a living wage. The strikers forced the wage issue onto the agenda. “I can’t be, Neil,” responded Trump. Entering into the irony-free zone where he is always most comfortable, one of the richest men in the world offered his sense of the challenge now facing the United States: high wages. It was the same with the other front-runner. Dr. Ben Carson trotted out the favorite fantasy that raising wages leads to unemployment. “Every time we raise the minimum wage, the number of jobless people increases,” Carson claimed. Florida Senator Marco Rubio, who rarely shows up for his day job these days, had another argument for denying a wage hike to moms and dads who go to work every day and cannot get out of poverty. So, just to be clear, in the future as Marco Rubio sees it, wages must remain low in order to keep a check on automation. Why? Because Rubio imagines a future in which the benefits of a technological revolution can only be enjoyed by CEOs, stockholders, and speculators. That’s the narrow and unthinking approach of the past that does not begin to recognize the options that are already available—and that will become even more available—to creative thinkers and innovative leaders. In a socially and economically responsible future, digital technologies and automation breakthroughs could allow the great mass of Americans to work fewer hours for greater pay. But that would require presidents and senators to respond to Main Street as opposed to Wall Street. Unfortunately, as Rubio’s response to the minimum-wage question illustrated, the Republicans were not about to address the economy in humane or realistic ways because they were not about to think outside the Wall Street box. Ohio Governor John Kasich and former Florida governor Jeb Bush bowed a bit to common sense on issues such as immigration, and Kentucky Senator Rand Paul had some wise things to say about the cost of a military-industrial complex. Several of the contenders grumbled about the absolutely worst excesses of crony capitalism and too-big-to-fail banking. Yet, for the most part, it was a night of billionaires, millionaires, and no-show senators refusing to even imagine that America might be a fair and functional nation where all citizens share in the promise of the future. In reality, the Republicans were far more focused on speaking to billionaire campaign donors and right-wing pundits than on addressing the issues Huerta and the working folks outside the hall were raising. The real debate was not on the stage. It was outside on the streets of Milwaukee and cities like it nationwide. 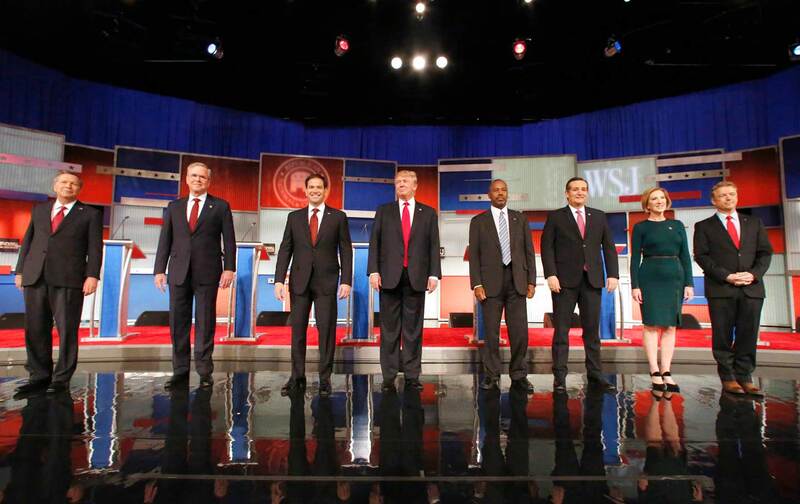 While the Republican candidates avoided that debate, the Democratic contenders embraced it. Former secretary of state Hillary Clinton sent a Twitter message backing the strikers: “Fast-food, home care, child care workers: Your advocacy is changing our country for the better.” And Vermont Senator Bernie Sanders, who has introduced legislation to raise the federal minimum wage to $15 an hour, along with a proposal to strengthen union rights, joined the picket line in Washington.